Do you feel like your backyard dreams aren’t living up to what you want them to be because your patio isn’t all you wish it could be? Is your time outdoors falling short because you don’t have enough reason to stay out there and truly enjoy yourself? Getting maximum use out of your yard and enjoying your time spent outside just isn’t going to happen if you have a boring back patio. Perhaps you’ve moved into a home where the previous owner had installed a barebones patio and you just feel like it could be so much more. Or, maybe you had the patio installed years ago but it has fallen short of your dreams. If that’s the case, you might be looking for a patio makeover for your Lancaster, Reading, Hershey, or York, PA area home. This might involve incorporating exciting features and amenities or even adding additional space with a patio extension. In the case that you are considering some sort of improvement, it's key to remember up front that the patio should in a good quality condition, without any structural issues. 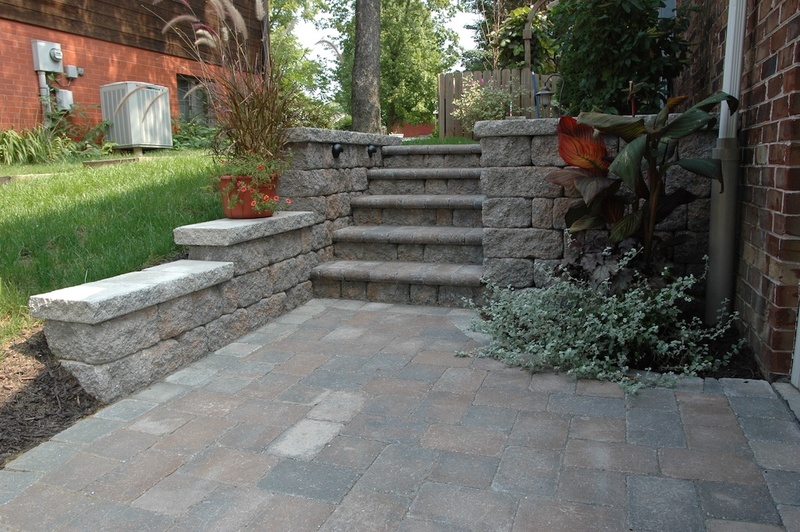 We never advocate for adding features to an existing patio in a unsatisfactory condition. Upon professional inspection, you'll know whether your best option is to either start from scratch or move forward in enhancing the existing patio. As you continue to read this article, let’s agree to assume that your existing patio has been inspected by a knowledgeable landscape designer or landscape architect. When it’s determined that there are no major structural issues, but you are to a point where you are ready to breathe new life into it, consider exploring the following ideas. 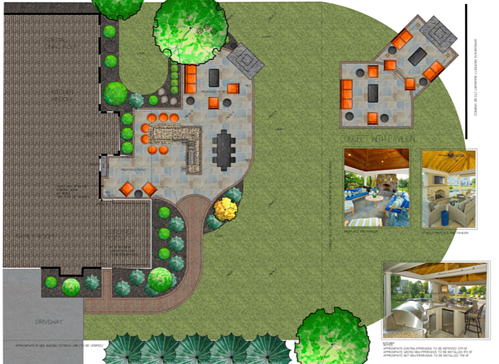 It’s important to mention that if you have big plans for your outdoor living area but can’t afford to do them all at once, then you might want to think about having a master plan created. This will allow you to phase the project over time. For instance, you might have plans to add an outdoor kitchen one year and ultimately expand to add a second “lounge area” with a fire pit and some privacy plantings at a later date. 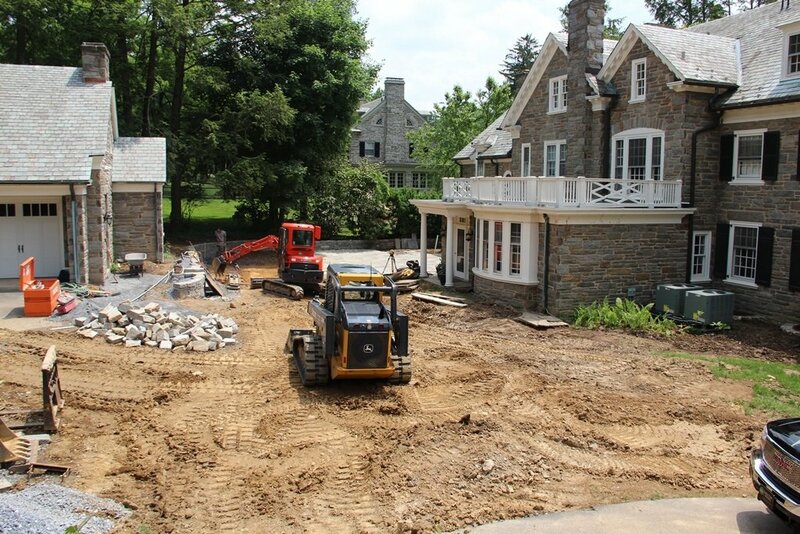 A backyard project of this scale, being performed over time, calls for a master plan. 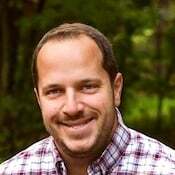 When you work with a master plan, then you can be confident that these future projects are complementary additions and that your projects are completed on a timeline that makes sense so that you’re not tearing up your patio at a later date for additions that could have been made during the proper phase. A first but important step in adding new life to your patio is cleaning and sealing your pavers to help refresh their look. 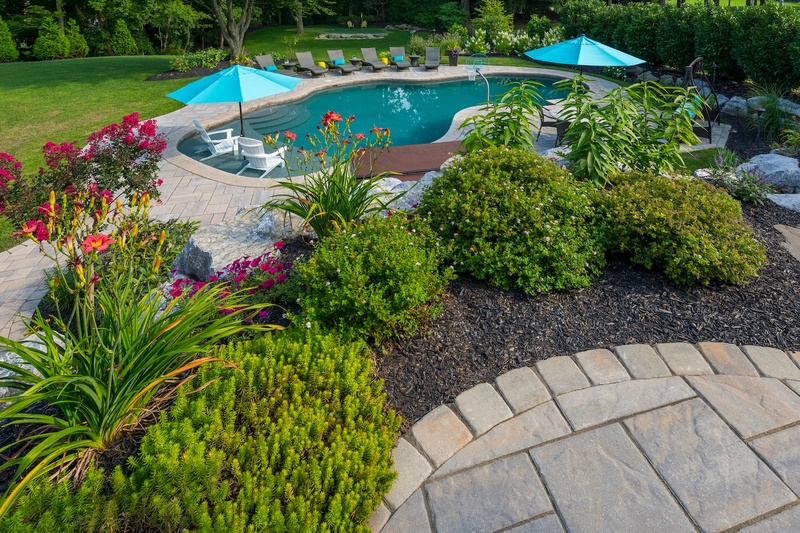 Over time, pavers can get dirty or even accumulate moss growth if not tended to. But cleaning and sealing can help refresh and protect them going forward. Want to be able to use your patio rain or shine? Then you might consider adding a pavilion to it. With a rooftop, you open up the possibilities for getting full use out of your patio. Not only can you still go outside and use the space when the weather isn’t cooperating, but you can also add elements to your outdoor area that you would not be able to if it weren’t covered—such as nicer outdoor furniture or even a television. Adding a pavilion also creates shade and a cooler space to escape to on days when the sun is blaring. You could even install a ceiling fan or overhead heaters in your pavilion roof and use it more months of the year! Nothing quite increases the usability of an outdoor living space like adding landscape lighting. 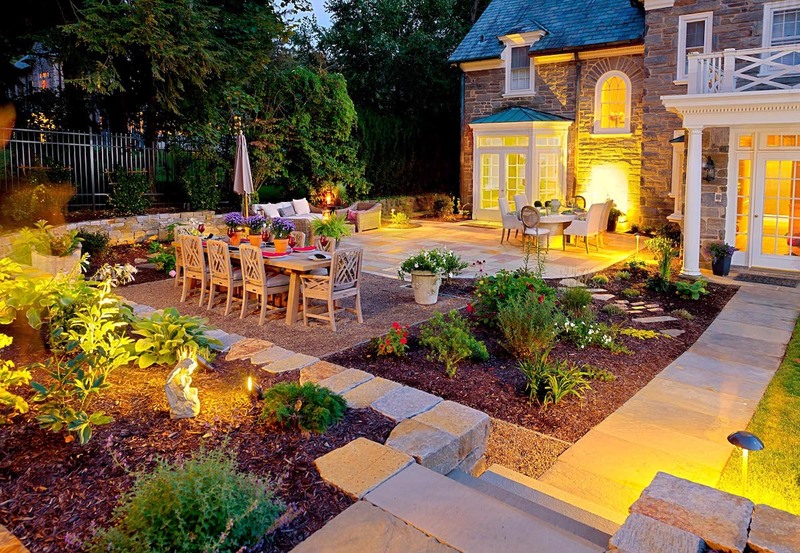 Lighting increases your usable patio time from daylight hours to around the clock. It also promotes the added value of safety and security to your space as well. With outdoor lighting throughout your entire space, you can now enjoy cooking up a meal in your outdoor kitchen without struggling to see what you’re doing. You can also serve it in the outdoor dining area with everyone being able to comfortably see their meals and the guests around them. A few random spotlights isn’t going to create the right atmosphere or light the space well enough. 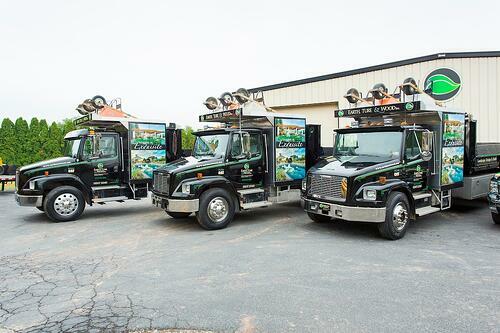 Professional landscape lighting calls for strategically placed lights including overhead lighting, surface lighting, up lighting, functional lighting, and more. Even something as simple as navigating around the space is so much easier (and safe) with proper landscape lighting. It’s definitely on the list of “must-have features” for an upgraded outdoor space. 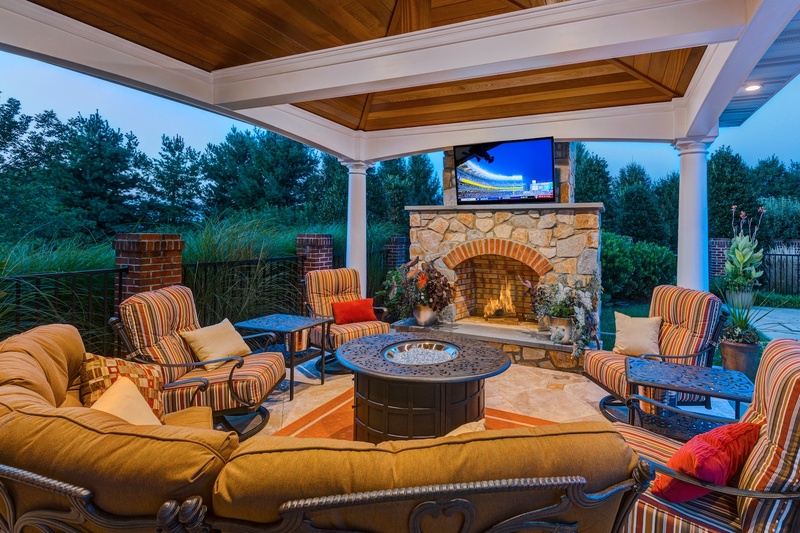 Audio and video additions can also help add excitement to an otherwise boring back patio. Incorporating high-quality outdoor audio that allows you to have different music playing throughout your entire space can take it to a whole new level. 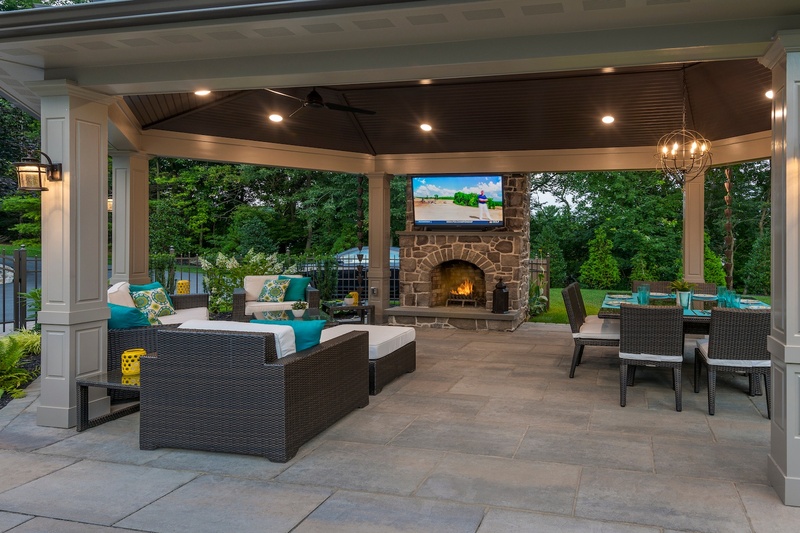 Similarly, having an outdoor television hooked up (as we mentioned, under a pavilion or roof to protect it from weather) so that you can watch the game or have an outdoor movie night will certainly enhance the entertainment capabilities of the space. 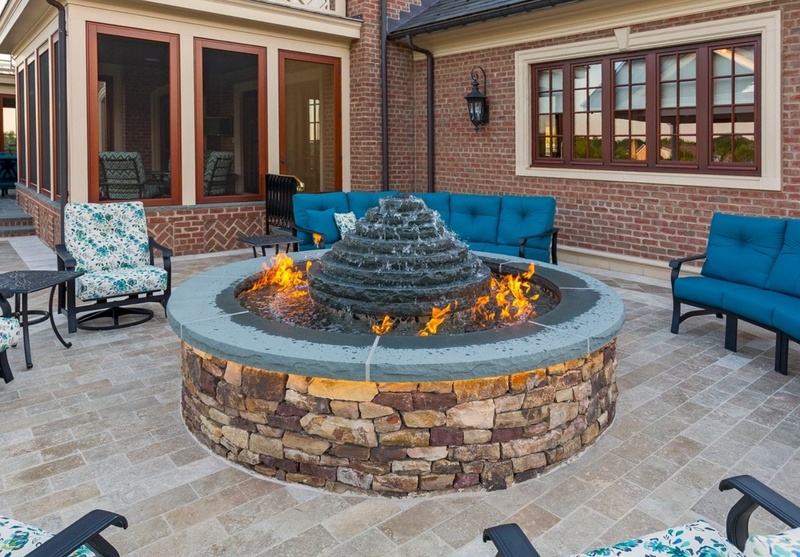 Fire features also help take a patio from simple to spectacular. 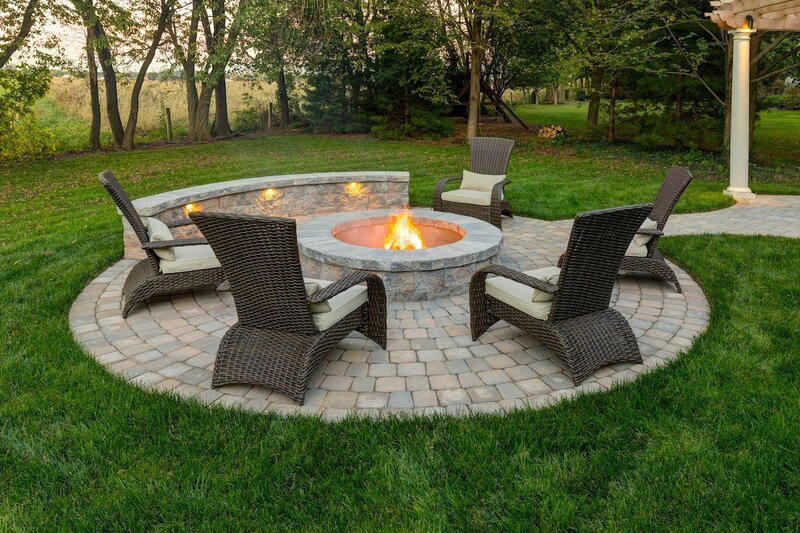 You might think about adding a fire pit to your existing patio space or you might even think about adding a separate fire pit area nearby. No matter where it’s installed, a fire feature really increases the overall enjoyment of a space. It casts light and heat and creates an ambiance like no other. Areas with fire features instantly become a “hang-out spot.” Everyone likes to gather around the fire to socialize. But they also make a great addition for a quiet evening where you just want to be able to relax and enjoy your oasis. Instead of fire, perhaps you want a water feature to add interest to your patio space—or maybe you want both. These types of features add visual appeal and really help take your patio from boring to beautiful. Whether it’s a simple fountain that gives you the sound (and visual appeal) of running water or it’s something more complex like a complete fish pond or pondless waterfall, there’s no question that adding water features really increases the overall enjoyment of your outdoor space. It’s amazing how much planting can also make a difference in sprucing up a boring back patio. Even just taking a plain space and adding bright vibrant color can seriously transform it. But plantings can also serve other valuable functions such as creating privacy or adding shade. With the right plant additions you can make an ordinary patio an extraordinary one. Sometimes the existing space is just not enough. If that’s the case, then you might also be thinking about expanding your patio to make it larger and therefore more usable. Perhaps you frequently host parties and you recognize that your guests don’t have enough room to spread out. Or, perhaps you are considering getting new furniture or creating an entirely new area of your patio for dining or entertaining. These are some of the common reasons that we hear when homeowners are thinking about patio extension ideas. Of course, when thinking about extending a patio, it’s so critical that it’s built in a way that doesn’t make it look like a haphazard addition. You’ll want to work with the right design expert who will think about extending your patio in a way that complements what is already there. This could possibly mean adding a separate patio area that is not attached to the current patio but in a way that still flows. 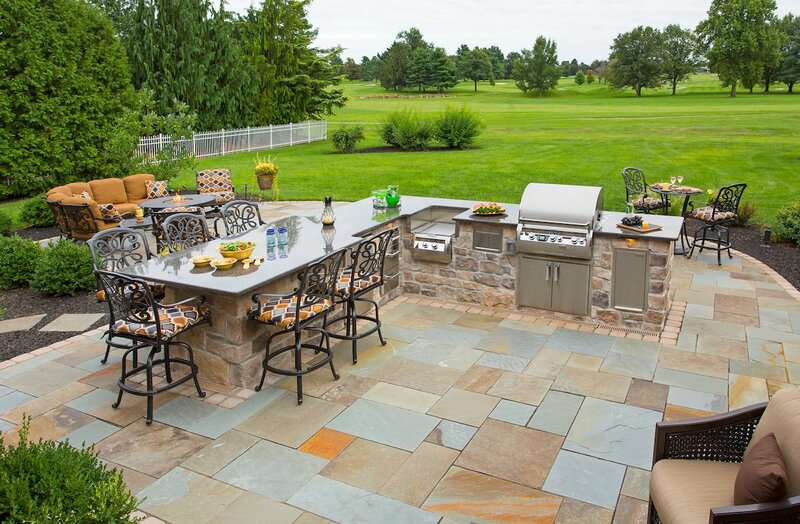 Perhaps your existing patio might be where you cook meals but your new patio might be a separate dining area. There are various ways to achieve your expansion needs and a landscape design professional can help determine what will work best for you. We hope this sampling of patio ideas has helped you as you think about taking your dull patio to a whole new level. We understand that the process might feel a bit overwhelming but it doesn’t have to! 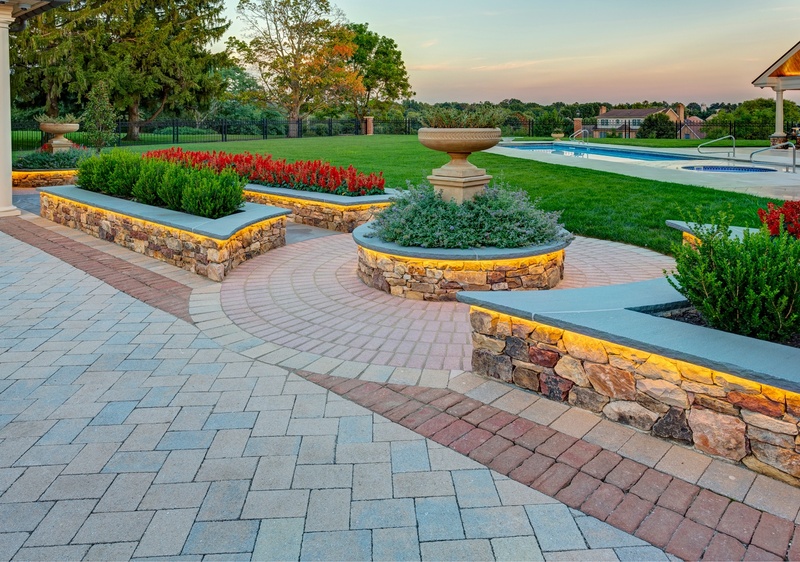 While there’s certainly a lot of different directions your project could take, a landscape designer will guide you in the process and help you make the best possible decisions. 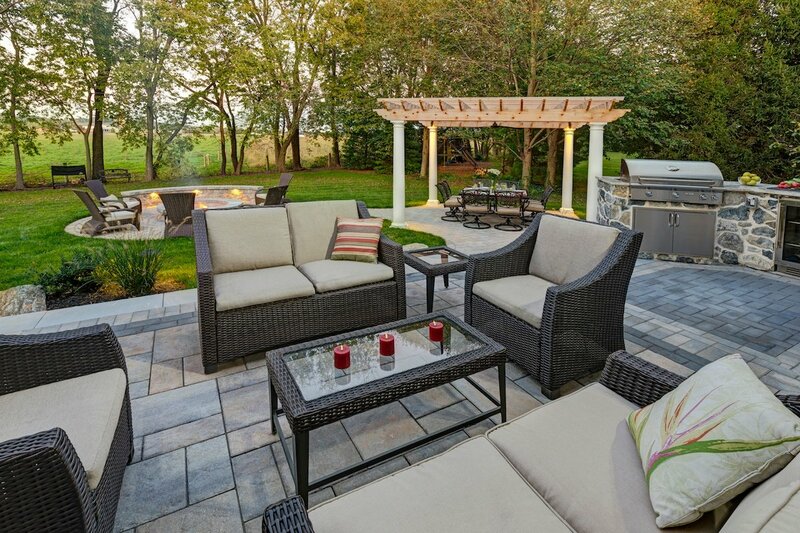 Of course, not all patio builders in the Lancaster, Reading, Hershey, or York, PA area are experts in this. In fact, many of these contractors are known for cranking out cookie cutter patios that have no appeal at all. This may be the very reason you’re looking to make changes—because you got stuck with a boring patio in the first place. But you can get out of this rut. Don’t get stuck with a patio that falls short of your dreams again. Choose your patio contractor wisely and gain the peace of mind that your finished patio will be absolutely spectacular. 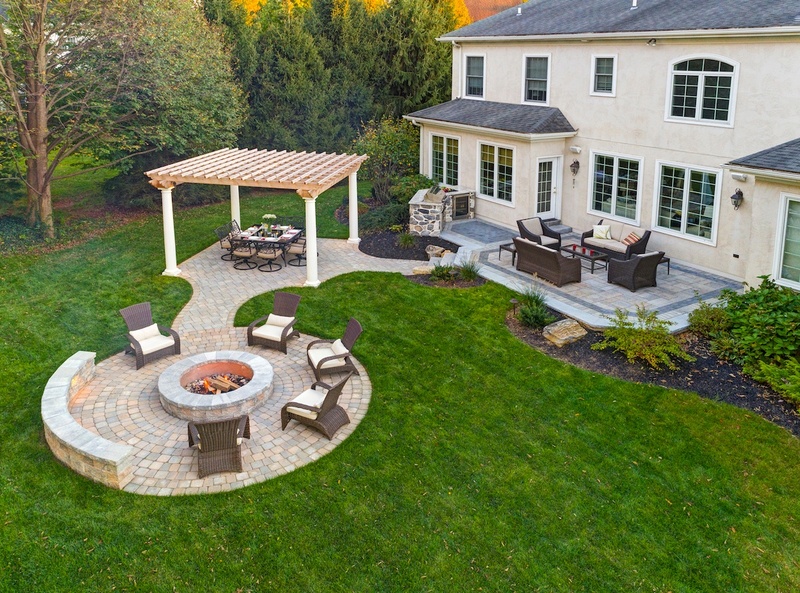 If you’d like to start a conversation about your perfect patio at your Lancaster, Reading, Hershey, or York, PA home, contact us for a free consultation or give us a call at 717-276-9447.